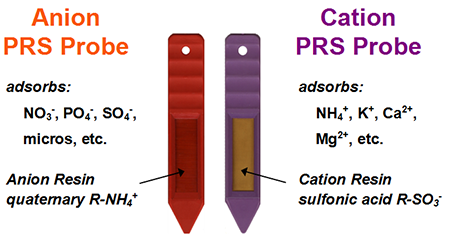 The ion-exchange membranes of PRS® Probes are a network of polystyrene cross-linked with divinylbenzene. Fixed ionic groups within the polystrene matrix provide the membranes with permanent charge. The fixed ionic group for anion probes is R-NH4+ while the fixed ionic group for the cation probes is R-SO3-. These are strong acid and base homogeneous membranes that are considered 'general purpose' or non-specific ion-exchangers. The selectivity of these membranes is based solely on the principles governing electrostatic attraction.